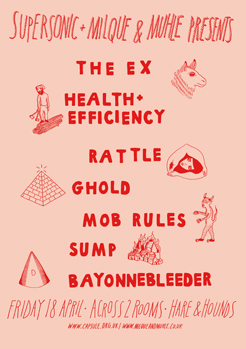 drumming duo RATTLE and experimental rockers HEALTH & EFFICIENCY. Meanwhile, Milque & Muhle will present their own eclectic mix of acts including GHOLD, MOB RULES, SUMP, BAYONNEBLEEDER + DJ SETS. The very talented Ellena Donlon from Milque & Muhle has created this fun poster for our evening of collaborative co-hosting. With such a diverse line-up we know it’s going to be a great night, so don’t miss out. Tickets include entry to both rooms. Born out of the punk explosion, when anything and everything was possible, the band have still managed to retain both curiosity and passion for their music. Using guitars, bass, drums and voice as their starting point they have continued to musically explore undiscovered areas right up to the present day.